※4 Linnarsson S, Björklund A, Ernfors P (1997): Learning deficit in BDNF mutant mice. Eur J Neurosci, 9:2581-2587. ※5 Mu JS, Li WP, Yao ZB, Zhou XF (1999): Deprivation of endogenous brain-derived neurotrophic factor results in impairment of spatial learning and memory in adult rats. Brain Res, 835:259-265. ※7 吉村玲児 ,杉田篤子 ,堀輝 ,中野和歌子 ,林健司 ,香月あすか ,上田展久 ,中村純 ,リア,マ.,アストロサイト ; 神経栄養因子 BDNF仮説の検証 . 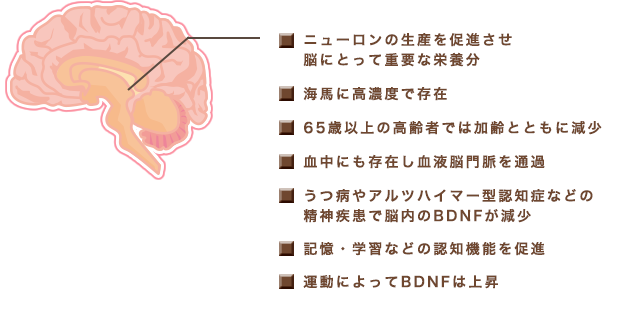 精神神經學雜誌 = Psychiatria et neurologia Japonica 2010, 112, 982-985. 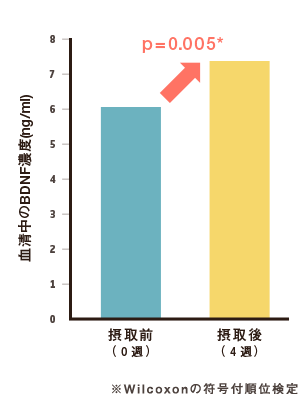 ※8 C. Laske, E. Stransky, T. Leyhe, G. W.Eschweiler, A. Wittorf, E. Richartz, M. Bartels, G. Buchkremer, and K. Schott; Stage-dependent BDNF serum concentrations in Alzheimer’s disease. Journal of Neural Transmission 2006, 113, 1217-24. ※11 Szuhany, K. L.; Bugatti, M.; Otto, M. W., A meta-analytic review of the effects of exercise on brain-derived neurotrophic factor. J Psychiatr Res 2015, 60, 56-64. S. A., Enhancing dentate gyrus function with dietary flavanols improves cognition in older adults. Nat Neurosci 2014, 17, 1798-803. ※14 Nurk, E.; Refsum, H.; Drevon, C. A.; Tell, G. S.; Nygaard, H. A.; Engedal, K.; Smith, A. D., Intake of flavonoid-rich wine, tea, and chocolate by elderly men and women is associated with better cognitive test performance. J Nutr 139, 120-7, (2009).